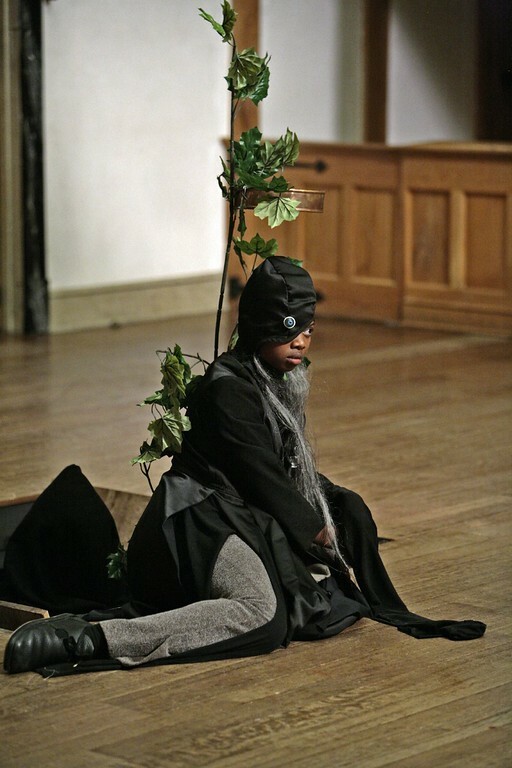 Susan Heyward in MACBETH. Photo by TOMMY THOMPSON. 2006. Celia Madeoy and Álvaro Mendoza in MACBETH. Photo by TOMMY THOMPSON. 2006. 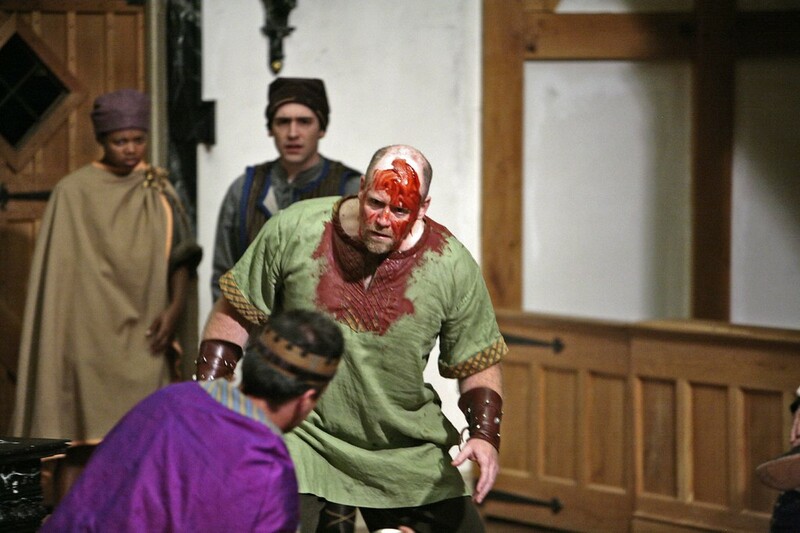 John Harrell in MACBETH. Photo by TOMMY THOMPSON. 2006. The cast of MACBETH. Photo by TOMMY THOMPSON. 2006. 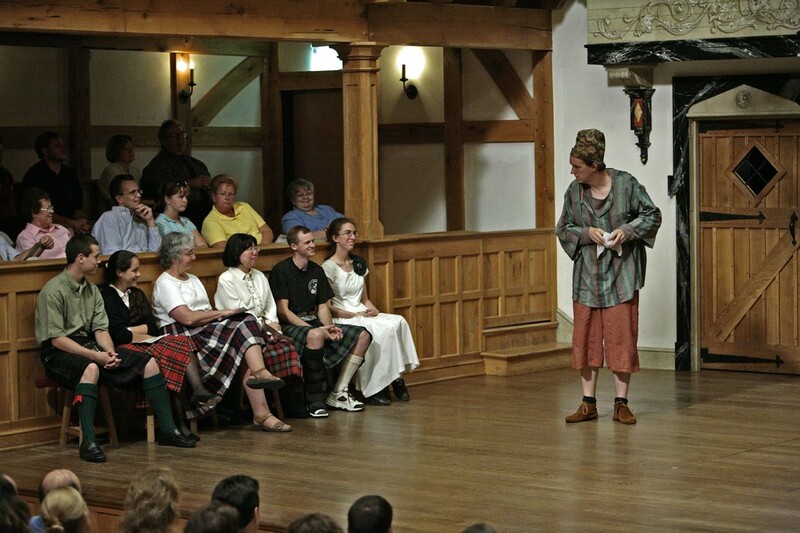 James Keegan in MACBETH. Photo by TOMMY THOMPSON. 2006. 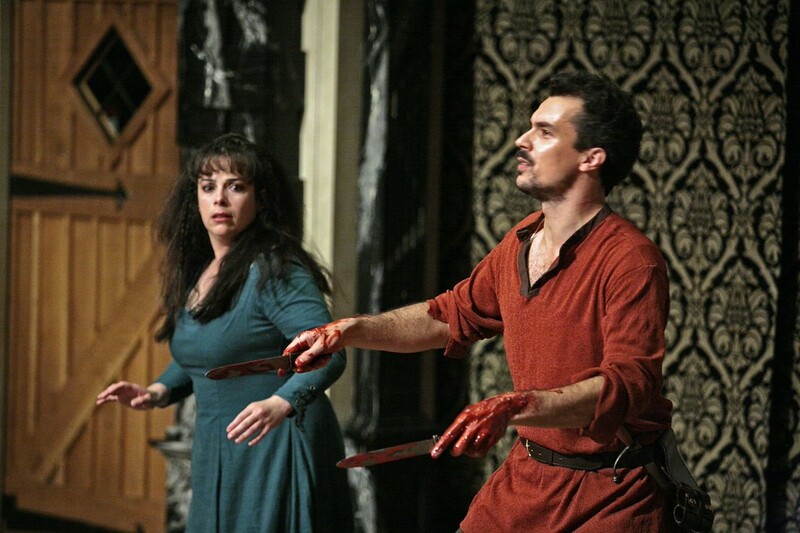 Álvaro Mendoza and Celia Madeoy in MACBETH. Photo by TOMMY THOMPSON. 2006. Sarah Fallon, Susan Heyward, and Jake Hart in MACBETH. Photo by TOMMY THOMPSON. 2006. 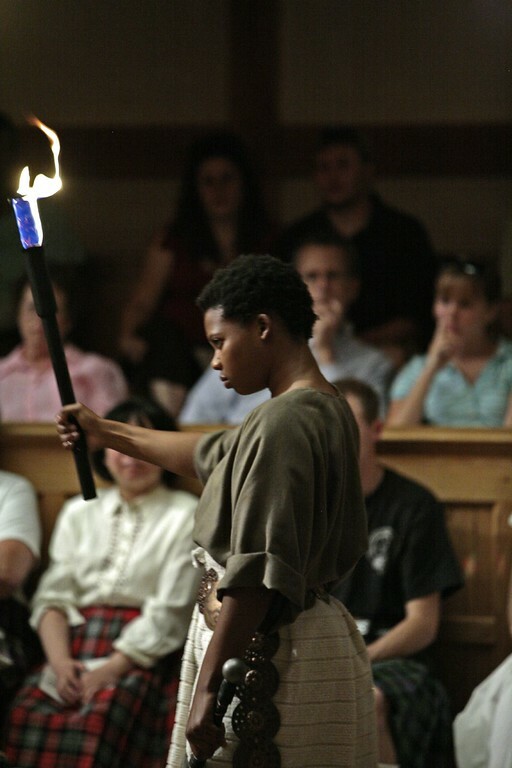 Celia Madeoy in MACBETH. Photo by TOMMY THOMPSON. 2006. Three “weird sisters” plan to meet with Macbeth. Macbeth and Banquo encounter the weird sisters, who predict that Macbeth will be pronounced Thane of Cawdor, then King; and that Banquo’s children will be kings. Almost immediately, news arrives that King Duncan has named Macbeth the new Thane of Cawdor. By naming his son Malcolm Prince of Cumberland, Duncan declares that Malcolm will succeed him on the throne. Duncan then invites himself to Macbeth’s castle, Inverness. 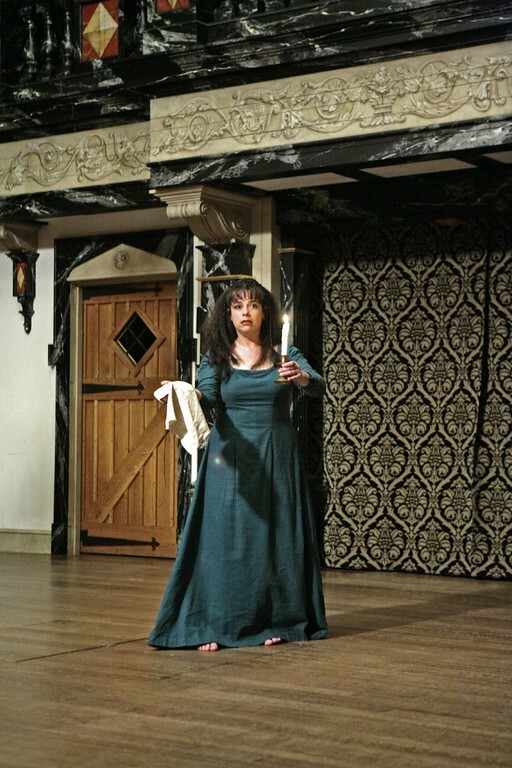 Lady Macbeth reads a letter from Macbeth telling her about the weird sisters’ prophesies; when Macbeth arrives, she urges him to “catch the nearest way” to the throne by killing Duncan. 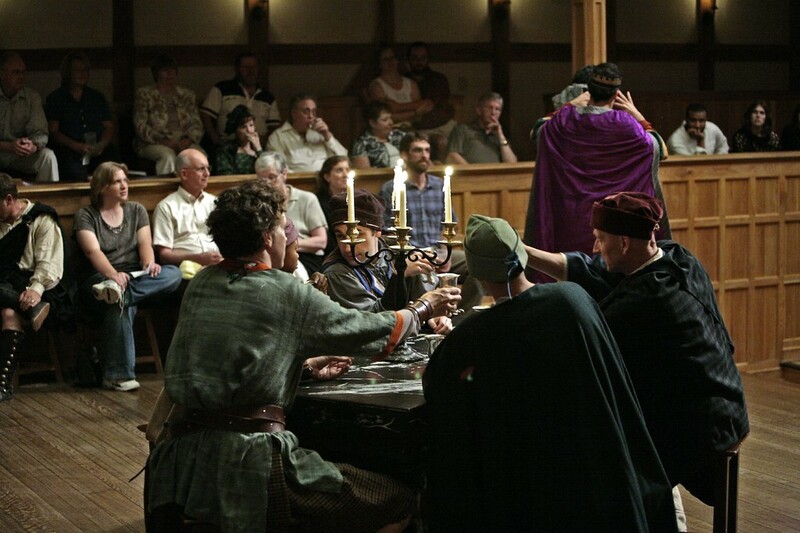 The ghost of Banquo appears at a royal banquet, but only Macbeth can see him. After Lady Macbeth dismisses the guests, Macbeth resolves to revisit the weird sisters and foresees more violence to come. The weird sisters use their magic to conjure apparitions who assure Macbeth that he cannot be defeated by anyone “of woman born” or vanquished until the Birnam Forest itself attacks him at his castle on Dunsinane hill (an unlikely occurrence, in Macbeth’s mind). All of Shakespeare’s plays are different from one another, but perhaps Macbeth is the most different. No other of his plays has as many scenes of darkness. No other of his plays has so high a percentage of questions – one in every five sentences is a question. No other of his plays has as many sound effects (and the sound of questions is one of those effects). No other of his tragedies is as short. As George Walton Williams, text consultant for this production says, Macbeth is Shakespeare’s densest play. Another word for dense is “thick.” And the thickness of Macbeth is both a feature of its language and of its matter. In a work half as long as Hamlet, Shakespeare explores – among other heavy subjects – ambition, family, generation, time, kingship, and, above all, murder. Macbeth is Shakespeare’s anatomy of murder, and he makes his look at murder thick in a variety of ways. He gives us three murders, each with a victim of a different generation and condition. He counterpoises the act of murder against the act of killing by having us first hear of Macbeth as the warrior who “unseamed” his enemy from the “nave to the chops and fixed his head upon our battlements.” When this warrior, urged on by his wife, considers a different kind of killing, the murder of his king, Shakespeare throws into relief the fragile distinctions by which we define murder and our own humanity. 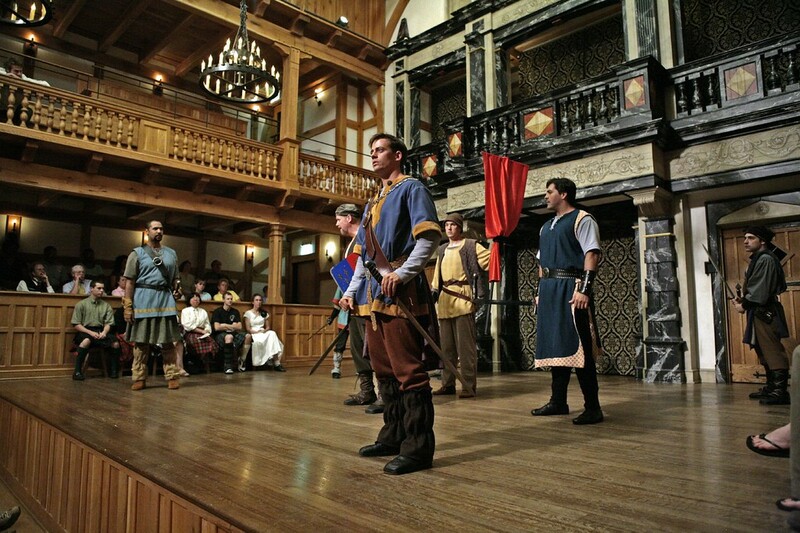 And Shakespeare “thickens” our understanding of murder when he takes us inside the thoughts of Macbeth, our tour guide for the play’s journey into murder. In Macbeth we have a protagonist we cannot but admire. He is brilliant, he is brave, and he never equivocates with himself about the immorality of the act or the likelihood that he cannot escape its consequences. He knows that “blood will have blood.” Accordingly, the blood in the play is also thick. Lady Macbeth uses just that word when she says, “make thick my blood.” And the play is thick with presentations of blood – a bloody soldier, a bloody ghost, and two scenes devoted almost entirely to the difficulty of having bloody hands. The other thick element in this play, as if in answer to Lady Macbeth’s prayer, is darkness. “Come, thick night,” she says, and Shakespeare accommodates her with a play so full of darkness that it blots out the sun. And Shakespeare and his actors, using the audience’s imagination, staged the darkness in three ways: they described it in words, they signaled it with props such as candles and torches, and they acted it.